I intended for this narrative to expand on the information we have for K-Line planers. It’s also about Richard Kneisley, and a network small industrial manufacturers in and around Toledo, Ohio, many of whom have gone out of business or evolved with the times. My curiosity about Kneisley Electric Company began when I bought a Yager planer in March 2007. Publication reprints on the .com site and discussions here provided a little information. What was known was that these planers were sold or badged by at least four different companies, Kneisley Electric Company in Toledo, Foster Manufacturing Co. in Buffalo, NY, Montgomery Wards and Astro Wood Planer Co., Bristol Conn. Later I learned that Freeman Supply in Toledo sold the K2000 as a M7A precision planer. The smaller 10” planer was made as both a Yager and a K2000 (A2000 by Astro) both basically the same design with some differences in casting. A Google search for Kneisley Electric Co. (KECO) listed it as a manufacturer of motion picture equipment formerly in Toledo and now located in Iola, Kansas. The folks in Iola had no knowledge of Yager or K-Line planers. A few pages deeper in the list of Google hits for KECO, I found a paragraph mentioning the late Garrison Kneisley as a donor to a University of Toledo scholarship fund and that he work for his family business - Kneisley Electric Company. Another search for Kneisleys living in Toledo found Robert Kneisley, an investment advisor. I blindly emailed him and asked if he knew any information about the Yager and KECO. To my surprise he responded saying “Yes, the firm did manufacture the Yager planer line” and he gave me his phone number. Bob was a tremendous help. He and his brothers Garrison, David and Tom as well as a sister, all worked at some point for their father Richard Kneisley and KECO. Bob was the youngest and suggested I talk to older brother Tom Kneisley to get more information. Tom, using his fathers laboratory notebooks and personal recollections, provided most of the following information. 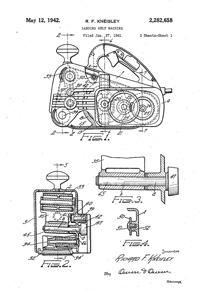 We’ve had good discussions here about machine patents and the men attributed to them like Herb Tautz, William Ocenasek, JE and WE Boice (also based in Toledo) and others. I’d like to add Richard Kneisley to the list. An inventor, innovator, and entrepreneur. I didn't ask Tom about Richard's education and early career. My questions were about KECO and the K-Line planers. However, Richard Kneisley's obituary stated he grew up on a farm in Upper Sandusky, Ohio and graduated from Upper Sandusky High School. Kneisley worked for Ohio Power Company. His interest in electrical engineering brought him to Toledo in 1928 and worked in design and development for The American Floor Surfacing Machine Co. At American Floor he designed and patented wood finishing and surfacing sanders some of which are shown here. 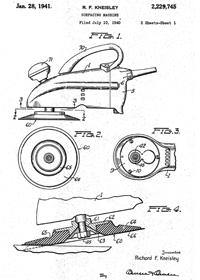 Drawing at left is Richard Kneisley’s 1940 patent for a surfacing machine later sold by American Floor as the “American Speedy Sander”. Next is a 1942 patent drawing for a surfacing machine and sold by Craftsman as model 207.2230 and manufactured by American Floor. 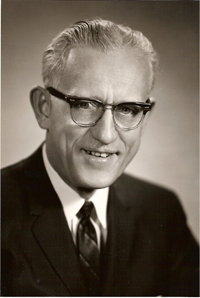 In 1936, while working for Strong, he started KECO in his garage at 3852 Watson Ave., Toledo. Tom said “The patents for the sanders were filed in 1940 and 41, so it appears that he worked at Strong, American Floor, and supervised activities at KECO. He was not opposed to working nights”. KECO’s core product was it’s Kni-Tron motion picture projector power rectifier and other equipment for motion picture projection. 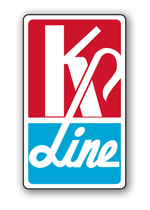 KECO also sold a number of tools under their K-Line brand. 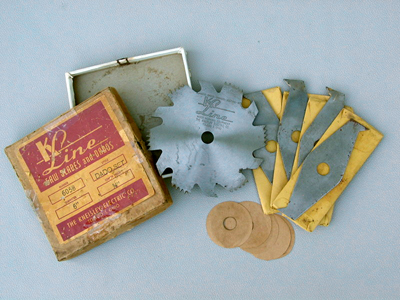 Twist drill bits and saw blade made by Vermont American were private labeled as K-Line. After starting the business in his Watson St. garage, Kneisley moved to the initial industrial site at 16 St. Clair Street and later moved to 500 South St. Clair. 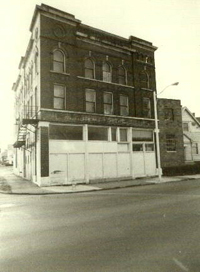 It is worth noting that American Floor was located across the street at 497 South St. Clair. 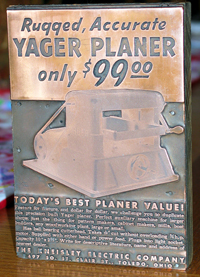 A printing block advertising Yager Wood Planers listed 497 as the location for KECO. When I asked Tom about this he said “The use of 497 So. St. Clair was used by both American Floor and KECO. This was a means of determining in which publication ad the letter writer had viewed, thereby enabling RFK and American Floor to assess the reader-ship and efficiency of the advertising.” Mike Miller sent a copy of the ad on the right from an April, 1942 issue of Popular Homecraft. The address listed here is 505 South St. Clair. KECO was finally located at 2501-2509 Lagrange St. which oddly enough was the former location of the Strong Electric Co.
Kneisley Electric Company, 2501 LaGrange St. 1945. Strong Electric Company name still shown above entrance. The building is still standing. Bob Kneisley remembers the K-Line business of KECO was sold to Reitz Tool and Die in Toledo in 1970’s. The assets of Reitz were auction off in 2005 and I have not been able to find more information about the company. 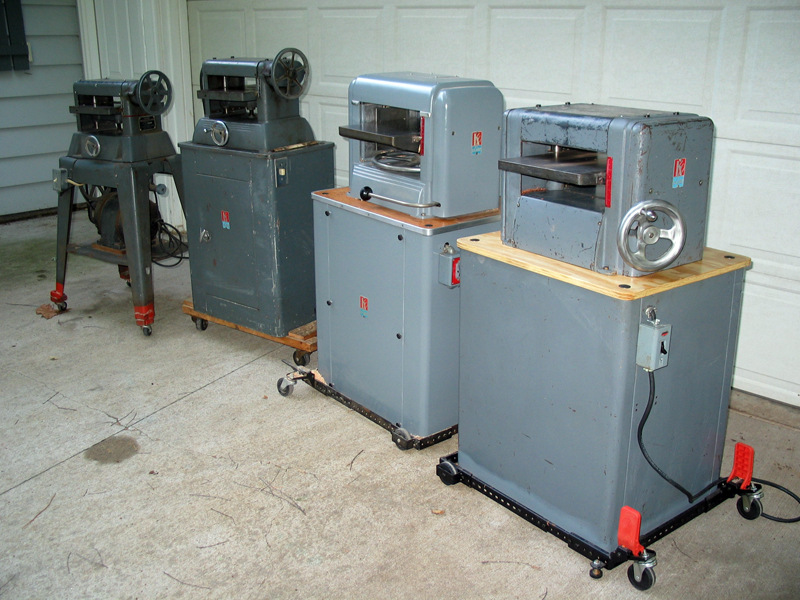 K-Line planers were sold by the Astro Wood Planer Company in Bristol, CT in the mid 70’s. Keith Bohn has noted that Astro advertised the A2000 up through issue 15-March/April 1979 of Fine Woodworking magazine. By the beginning of 1980 the Astro ads ceased. I had a chance to talk to Betty Schiffler, Kneisley Electric’s office manager from 1965 to 2006. Although her 41 years at Kneisley came later during K-Line manufacturing, she did say the main manufacturing focus of KECO at that time were the motion picture equipment, stock tank heaters (another one of RFK’s patents) and the planers. They employed 50 people at it’s peak until the motion picture part of the business was sold to the Ewell brothers - Clinton and Harry. Bob Kneisley told me that their father, Clinton Sr., was Richard’s banker and close friend in the early years. “Dad felt it appropriate to sell the business to Clinton Seniors’ children to complete “the circle”. Betty mentioned that Richard was “the nicest man she’d ever met”. I have found that comment repeated many times on movie equipment discussion groups from folks who knew or did buisness with Richard. Betty said that Richards wife Florence passed away when their children were younger and Richard would bring the kids to the factory every day, “He made those kids work”. Betty confirmed the sale of the planer business to Reitz Tool when they stopped showing a profit “although every customer loved them”. Illustration from the 1949 Powr-Kraft catalog. 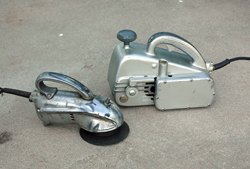 KECO produced two models of thickness planers. The 10” x 2-3/4" Yager/K2000 and 12-3/4” x 4" K2100. The initial prototype K-line (Yager) planer was 12” in width but the final production model Yager planer was 10” wide. Tom said Edward Yager designed the K2000 10” planer but has no clear recollection of Yager himself. Yager did apply for a patent for a “ornamental housing for a wood planing machine” in 1945. 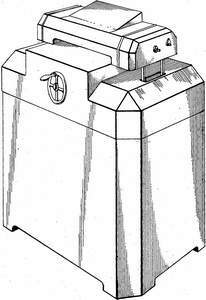 The patent drawing shows a slight resemblance to the later closed cabinet base for K-Line planers. The cutterhead pulley is on the right side of the K2000. 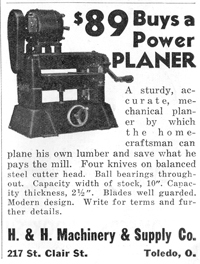 The earliest ad I’ve found is from the December 1938 issue of Popular Homecraft for H&H Machinery and Supply, (also on St. Clair, Toledo) and shows the cutterhead motor mounted top of the chip guard. The two previous ads, shown above, have the motor behind the planer. Later models were powered from below. I am aware of three types of feed options for the Yager/K2000. The original was a crank type hand feed. This option was available for the entire production life of the planer. Two types of power feed were offered. The first was a geared type attachment using a second motor on the old style Yager. I haven’t found any documentation for this option, only a photo of serial number 1147. 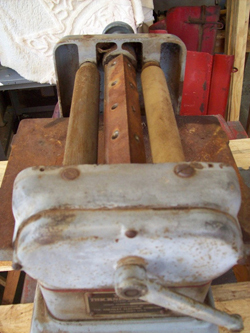 The second powerfeed option was driven from a common motor utilizing a countershaft below the open stand or closed cabinet option. Sometime before 1948 the “Yager” name was removed from the side castings and the design of the base was given a modern look. The new design might have coincided with Foster Manufacturing rebadging the K2000. Two labels from Foster Line K2000 models. 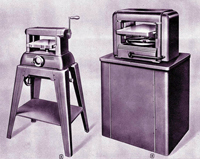 Montgomery Wards sold both planer models in its Powr-Kraft catalog from 1949 through 1955. The early years 49-52 Powr-Kraft sold them as Foster Thickness Planers. In 1953 to 55 they were listed a K-Line planers. Foster rebadged a large number wood working machinery as Foster Line. 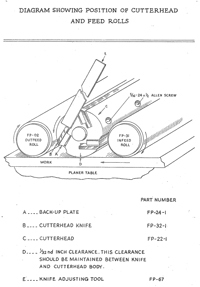 Tim Kuist discovered a binder of Foster Manufacturing literature showing table saw, lathes, bandsaw’s etc. all rebadged from known manufacturers. Among those I am able to recognize are a Darra James 12” cabinet saw and the Spee-D-Kut 12” tilting arbor. Foster also rebadged a 4” jointer, 12” bandsaw and 8” table saw all manufactured as Craftmaster by Henry Power Tools Ltd of London, Ontario. 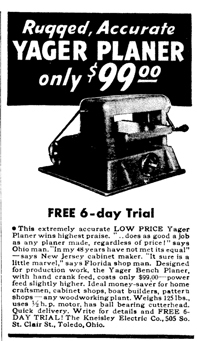 Like the Yager planer, the Craftmaster name was removed from the casting before being sold by Foster. It’s also interesting to note that like Richard Kneisley, William Joseph Henry, started his manufacturing plant in his garage. Toledo at this time was known for industrial manufacturing. Richard Kneisley used Toledo resources well. For a period of time the machining and final assembly was done by L&N. Manufacturing (Lucy and Nick Gibbs) in Hudson, MI., about 30 miles from Toledo. The only additional information I could find for L&N was that they started business in January 1943. Foster Manufacturing listed the F.O.B. as Hudson, MI. Alloy Founders - second from left, located at Bancroft and Smead Avenue, and Daney Casting Company on Basswood poured some of the aluminum castings for the K2100 and K2200. Yarder Manufacturing - above right, may have produced the top and chip guards for both model machines. Machining of the infeed and out feed rolls was done in-house by KECO. Rubber was applied to the outfeed roll by Ottawa Rubber Co. in Bradner, OH. A lot of folks helped gather this information. Tom and Bob Kneisley were both extremely patient and took time out from their busy schedules to answer questions. I hope that I’ve drawn an accurate picture of their father. If you get a chance to look through his patents, I think you will see a pretty interesting mind at work. Mike Miller retyped a faded price list and parts diagram that he will be posting to the MS when it’s up and running. With out that list I would not have known about the 4 knife cutterhead. Brian Clauto sent great photos of his Foster planer and dirty paper “Instructions or the Care and Operation of the K-Line Planer”. He will post those to the MS. Tim Kuist gave me a stack of Foster Manufacturing dirty paper including one for it’s K2000. Keith Bohn provided catalog scans and other details. Ron Cox of Wichita, KS sent the photo of a water slide decal on his Foster Line K2000. The old photos of Toledo businesses are from Toledo Lucas County Public Library “Images in Time”. A collection of over 80,000 historical photographs of Toledo and Northwest Ohio.